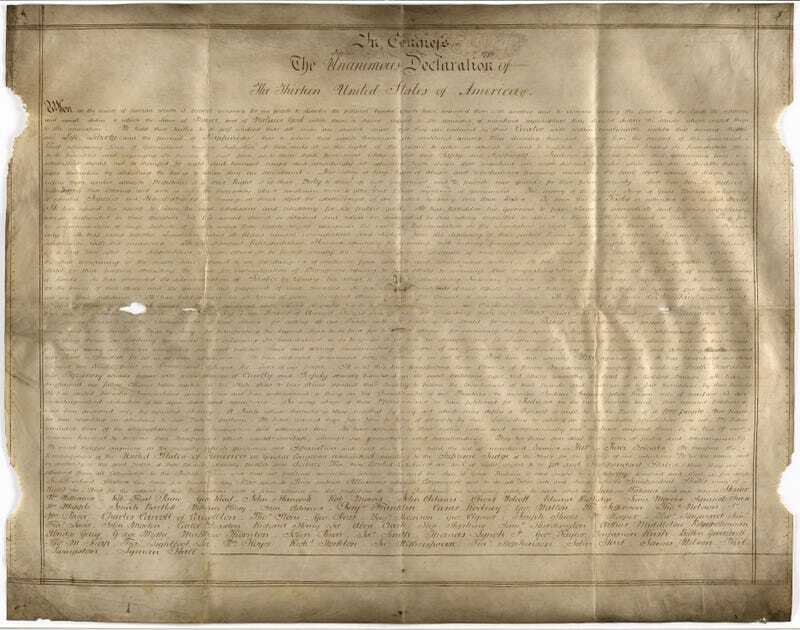 Nearly two years later, the team has concluded that the document—now known as the Sussex Declaration—is an authentic copy of the Declaration of Independence handwritten on parchment at some point during the 1780s. The only other parchment version is the Matlack Declaration, which is kept at the National Archives. Other handwritten copies of the Declaration exist, but in those versions the text was written out on letter-sized paper for private circulation. These findings are set to appear in an upcoming edition of Papers of the Bibliographical Society of America. The newly discovered manuscript is the same size as the original, 24" x 30", but it’s oriented horizontally rather than vertically. The list of signatories is in an alternate order—the name John Hancock isn’t listed first. Weirdly, several names are misspelled. There’s also a blotch at the top that looks like some kind erasure. The text contains very little punctuation, and the handwriting style isn’t one the researchers have seen before. Other interesting features include marginal ruling, decorative penwork around the titling, evidence of nail holes, and justified, round hand script. Sneff and Allen say the document was likely commissioned by James Wilson of Pennsylvania, a signatory of the Declaration and a contributor to the US Constitution. Evidence also suggests the parchment was owned by Charles Lennox, the 3rd Duke of Richmond. Known as the “Radical Duke,” Lennox was an avid anti-colonist and support of American Independence. The manuscript was likely produced in either New York City or Philadelphia, and then sent across the Atlantic to the Duke. Like the 1776 Matlack Declaration, the Sussex manuscript was written in an exaggerated size, known as an “engrossed” manuscript in the parlance of the time. As the New York Historical Society explains, “it denotes a document written in a clear, formal hand, meant to be the authoritative copy.” The document was produced in the 1780s, after the original version and the American Revolution. It was also written during a time of financial and political uncertainty, and it was meant to send a message. Accordingly, Sneff and Allen believe the ordering of the signatures was adjusted for a very good reason. In other words, this version of the Declaration was an expression of American unity and cohesion. Looking ahead, Sneff and Allen would like to learn more about Charles Lennox and how he came to possess of the document. They’re also planning to work with a spectral imaging team to see if they can read some of the text that was scraped away at the top of the document.